African leaders called on Thursday for firm action against the rising Islamist militant threat stretching across the continent from Kenya to Mali and pledged to provide the tools for Africa to police its own conflicts. Violence cast a shadow over the opening of the two-day summit of the 54-nation African Union (AU) as Nigerian President Goodluck Jonathan rushed home to deal with the aftermath of a bombing in the capital Abuja on Wednesday. At least 21 people died in the attack by suspected Boko Haram militants. “The continent faces an increasing challenge in trans-border threats, with terrorism at the forefront,” newly elected President Abdel Fattah al-Sisi of Egypt told the opening ceremony in the Equatorial Guinea capital Malabo. “We need to strengthen our cooperation and align our national policies to effectively counter this” he added. Sisi pledged Egypt would play an active role in peacekeeping across the continent. The former army chief was marking Egypt’s return to the continental bloc after elections meant to turn the page on his ousting of an elected Islamist president. 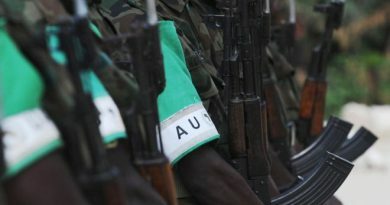 The African Union is seeking to put in place an African Standby Force (ASF) to deal with regional crises. A senior AU official said on Wednesday progress had been made toward having the force, which is made up of five brigades from the different regions of the continent, operational by the end of 2015. The force has been under discussion for more than a decade but its establishment has been hampered by concerns over its command structure and funding. AU Chairperson Nkosazana Dlamini-Zuma said armed Islamist groups from Boko Haram in Nigeria to al Shabaab in Kenya and Somalia were a menace to the entire continent. She urged the bloc’s Peace and Security Council to study new ways of countering it. A final statement from the summit on Friday is expected to make a commitment to strengthening Africa’s security institutions, as well as commitments to promote sustainable agriculture on the continent. U.N. Secretary General Ban Ki-moon, addressing the opening ceremony, said the United Nations would work closely with the AU’s strengthened security apparatus. He called for an end to violence in Central African Republic and South Sudan. 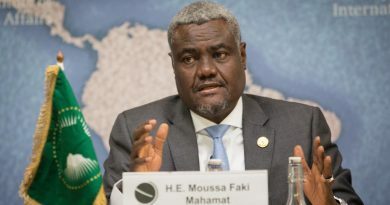 In Mali, he urged the government to immediately open talks with separatist rebels in the north, after clashes last month threatened to plunge the West African nation back into chaos. An Islamist takeover of northern Mali in early 2012 led to an intervention by French military forces who repelled the al Qaeda-affiliated insurgents – a painful reminder to African leaders of their failure to implement their Standby Force. Mali’s foreign minister told the press this week that the first direct talks between the government and the armed groups were due to start in the coming weeks in Algeria. ← WHO Calls Emergency Sub-regional Ministerial Meeting To Tackle Ebola Outbreak In West Africa.